There is something wonderful about a sessionable beer. Now don’t get me wrong – I love double IPAs, barleywines and imperial stouts as much as the next boozehound, but a low alcohol sessionable beer that is high in flavour makes me truly happy in the summer. I’m in my mid-thirties now and I don’t have the same tolerance I did when I was 27. 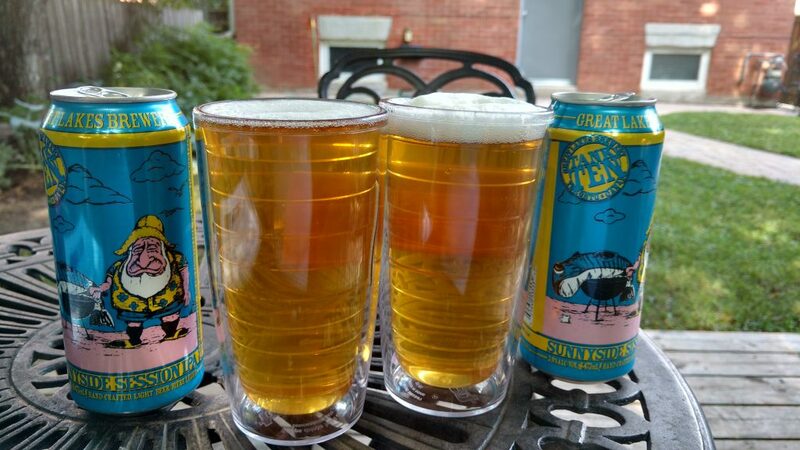 Great Lakes Brewery has released Sunnyside Session IPA as part of their Tank Ten series, at a sessionably low 3.9% ABV. I do wonder why they’ve called it an IPA instead of just pale ale, as it clocks in at a very low 25 IBU. For comparison, their Octopus Wants to Fight IPA punches you in the face with 88 IBU. The name pays homage to the west end of Toronto and to Sunnyside Pool. I could see this being popular on a picnic to High Park since it’s only $2.80 a can at the LCBO – bring it for a Pokemon Go break. Appearance: Golden yellow colour. White head, fades fast. Aroma: Tangerine notes with a slight breadiness reminiscent of the inside of a crusty loaf of bread. Taste: Very light on the palate – tastes like a light beer. Surprising cucumber notes that I couldn’t place. Faint hints of tropical fruits – very faint, if this were a President’s Choice named beer, I would call it “Memories of Tropical Fruit”. Aftertaste: Drying bitterness on the finish. Overall: Tastes like a simple blond beer that could have been fermented in tanks that had previously contained a hop bomb. Works as a light beer but not as an IPA. Tastes much better on tap than in a can. Suggested food pairings: Nothing over powering. Tuna sandwiches with potato chips, chicken with a tangerine glaze.